Today's post isn't going to be the most uplifting, but this information needs to be shared. There are too many cats in Spokane. During the first week of the month, between July 1-6, the Spokane County Regional Animal Protection Services (SCRAPS) took in a total of 234 animals — 145 cats and 89 dogs. Many of the dogs were brought in following the Fourth of July fireworks, and a large percentage have since been reclaimed because their owners had the foresight to microchip or ID tag their pets. Yet, during the same 6-day period last year, SCRAPS took in roughly half as many animals — 43 dogs and 59 cats. The cats, unfortunately, haven't been as lucky as their canine cohorts. SCRAPS moved into its brand new, centrally-located facility (6815 E. Trent Ave.) about a month ago — a facility that includes 100 cat kennels; twice as many as its former building — but with all these new feline residents, the shelter's cat room is full. A video by KHQ news shows just what that's like, as cats beginning crying out for attention as soon as the photographer and SCRAPS director Nancy Hill walk into the room. 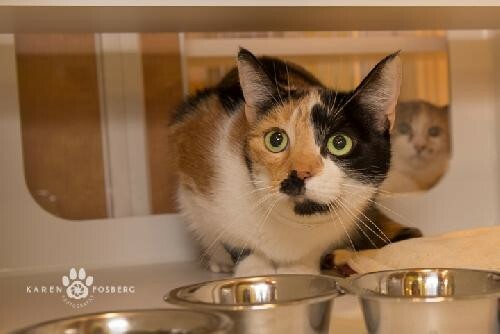 Molly (4220) is a sweet, friendly adult calico currently waiting for a home at SCRAPS. In the video, Hill credits the recent influx to one thing: owners are not spaying and neutering their cats. Though it is indeed kitten season, and all the kittens ending up in shelters are irresistibly cute, adorable and playful, they're going to grow up and many of them, sadly, will end up back in a shelter. There is a little bit of silver lining in this unfortunate situation. Earlier today SCRAPS shared on its Facebook page that 58 total dogs and cats have been adopted since the shelter announced an ongoing adoption special to help find homes for its wave of new residents. From now until Sun, July 13, all animals — dogs, cats, puppies and kittens — have their adoption fees waived. Adoptees just pay the $15 cat or $25 dog licensing fee for their new pet. You really can't find a better deal. All pets come spayed/neutered, vaccinated and microchipped. The regular adoption fee for cats under 6 months is $62.70; cats older than that are $40 and all dogs are $87.04. SCRAPS is open tonight until 5:30 pm, tomorrow from 10 am-5:30 pm and Sunday from 10 am-5 pm. This post might have raised some questions about what to do if you find a homeless animal, like a litter of kittens that seem to be living outdoors on their own. Back at the beginning of "kitten season" we featured some local shelter staff's tips on what to do if you find homeless kittens. Just yesterday, an Inlander staffer found a tiny grey kitten wandering around her front yard panting in the heat. He's luckier than many other kittens — he's already spoken for and saw a vet this morning who gave him a mostly clean bill of health. The first and best thing to do if you find a kitten, like Inlander staffer Gail did yesterday, is to ask around your neighborhood to see if anyone's missing a cat. Posting a "found" notice in on Craigslist with details about the cat and photos is another way to try and reunite the cat with its family. While you're at it, scroll through the "lost" pet posting to see if any match the description, too. If you're not able to house the cat while trying to find its owners, you can take the animal to SCRAPS where it will be impounded and also scanned for a microchip. Unfortunately, the chances of it being reunited with an owner after being brought the shelter are staggeringly low. Less than 5 percent of cats entering shelters end up being reunited with their owner, compared to 26 percent of dogs. The bottom line is — if you're able — do as much in your power to help a lost pet find its owner if the animal doesn't have a tag, microchip or a searching owner. Pet overpopulation is a shared issue in every community. Encourage people you know to spay and neuter their pets, and to get a microchip or collar for their pets if they let them outside, even supervised. You never know when accidents may strike. If money is an issue, there are many resources to help paying for a spay/neuter surgery, not limited to: SCRAPS's free spay/neuter vouchers; SpokAnimal's and the Spokane Humane Society's low-cost clinics; along with the many services offered by Pet Savers.